Is Your Farm or Ranch 100 Years Old? One family. One farm. One hundred years. In the last 100 years, the United States has fought two world wars, wars in Asia and the Middle East, suffered through the Great Depression, the Dust Bowl, the farming crises of the 1920s and 1980s, the globalization of the economy and the growth of multinational agribusiness, all of which have taken their toll on the family farm. Recognizing the difficulties Idaho farm and ranch families have had to contend with and recognizing the extraordinary contribution agriculture continues to make to the state economy, the Idaho Department of Agriculture and the Idaho State Historical Society wish to honor those families who have farmed or ranched the same land their ancestors did 100 years or more ago. 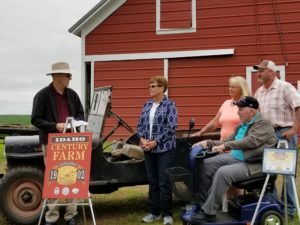 Since the program began (1990), over 400 farms and ranches statewide have been designated Idaho Century Farms or Ranches by the Idaho Department of Agriculture and the Idaho State Historical Society. The program recognizes a farm or ranch owned and operated in Idaho by the same family for at least 100 years, at least 40 acres of the original parcel of land still maintained as part of the present holding. Applications may be obtained by calling (208) 514-2326 or writing the Idaho State Historical Society, 2205 Old Penitentiary Road, Boise ID 83712. To download the application click here: Century Farm/Ranch Application. Please email us if you have any questions. Applications are accepted and reviewed for eligibility quarterly throughout the year. Let us celebrate your family’s contribution to agriculture in Idaho!